Dave and Donna Shoemaker operate Life Images in Kennett Square, Pennsylvania from their country studio set on five beautiful acres. 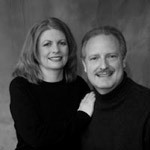 They have been serving the surrounding area with distinctive photography and video services for more than 25 years. We love working with our clients. Whether it’s a wedding, a family or infant portrait or business photography our aim is to capture something special. You will enjoy the process and the beautiful result. Your finished portrait or wall grouping will make you smile every day. Call us and make an appointment to capture the people in that moment in time that matter the most. It will be fun!